Features: The different attack head will bring you a different sense of security. Come with a chain, if the size doesn't fit you, you can hang around the neck as a necklace, a wonderful decorate in daily life. Used for break window or defense in a emergency situation. Simple, Fashion, Security. Perfect idea to give your lover, friends and families as a gift. 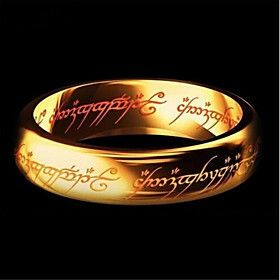 Specification: Color:Golden/Black Sliverfor Randomly ship~ Inside Diameter: about2.05cm Weight: 35g Material: High-gradeZinc Alloy Attack Head Material:Tungsten Packing Includes: 1 xPocket Self Defense Ring (Golden/Black Sliverfor Randomly ship~) Please Note: 1. Please allow 1-3cm error due tomanual measurement. 2. Please understand that colors mayexist chromatic aberration. Very Good 0897500067 Your purchase benefits those with developmental disabilities to live a better quality of life.